Where are the other 96 red balloons? It's no surprise that Mario Kart 7 features courses from previous games, but now you can race by land, air and sea some past tracks might work a little differently. In the new shots below we've got some aerial action in Mario Kart Wii's Mushroom Gorge, the return of Balloon Battle in a Super Mario Kart-inspired battle stage and the Luigi Mansion stage from Mario Kart DS. It's not all recycled content though: half of the game's 32 courses are brand new, and some even feature sheep. Or goats. We're not sure which. Last week Nintendo revealed more about Mario Kart 7's online features, including the new Community tool and Mario Kart Channel. Damn. Now I really want this game. Can't wait. Finally a game that is trying to add something different and not just churn out more of the same. Lets hope the online works well. Oh god yes! Waluigi Pinball is back! Curious about the motion controls as well. That looks good. Wasn't real interested until seeing that. woah, lakitu is playable? sweet! love that little guy. so long as he's not dropping those spiked guys on me. All I can say is...you're going down N-life community! Does anyone know if there have been any sort of DLC for this yet? With new and or old tracks being made available? I so want this game now! Looks like this game will be fantastic! Nintendo have really spoiled us with all the Super Mario 3D Land/Mario Kart 7/Skyward Sword content, as of recent. This game just keeps looking better and better, the only 3DS game I'm looking forward to more is Tales of the abyss. Might finally get a 3DS with this game if I see a good deal this christmas. Though I have played a demo of MK7 & it kinda sucked, though that's because the options were limited. Can't wait to be able to customise which wheels & build etc. I want & hopefully no cheating online would be nice! Oh my, the raccoon tail! 1. 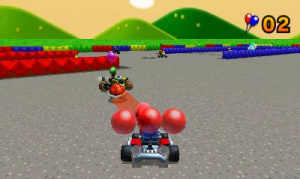 Are the balloon battles like the ones found in Mario Kart Wii, or are they the far superior ones found in the rest of the series? 2. Are those sheep or goats? My money is on the latter. I just hope they add more tracks later as DLC, even if I have to pay for them. Hey, I really enjoyed MK Wii online battles! I'm pretty sure those are goats. When will Nintendo bring back Yoshi's Valley and N64's Rainbow Road? Those are my 2 favorite Mario Kart tracks. This game just keeps on getting better and better! At first I thought it was going to be just like Mario Kart Wii, but it appears that they are trying new ideas, which I highly support! It's great they brought Mushroom Gorge back. That place is awesome! Waluigi Pinball is the best!!! This game is at the top of my christmas list. So what is with the "retro" courses. Most of them are Wii and DS. Seriously I don't want to see a minor course upgrade from a recently put out game. Maybe a silly question, but does this game also have a online leaderboard (like Mariokart Wii)? @WiiLovePeace: #25 - Last I checked, Wal-Mart was selling online bundles for about $180.00(now $199), though I've never heard of the particular choices of optional games included in the bundle. Um... nintendolife? Did anyone else notice that at the end it said December 2ND. Not 4th? Is it now gonna be released on the 2nd? That'd be epic... NL please answer!!! Lovely. By the looks of it, the old style of Balloon Battling is returning, unlike the kind in Mario Kart Wii. Can't Wait! Thanks for the answer! Not that I am good at timetrials (I am very bad at it). But I will try anyway when I have the game! and 4th of december for the USA. Yes!!! Waluigi Pinball! Coconut Mall!!! The only way Nintendo could top all of this is by adding Pauline as a playable character.